In line with a MoU signed between GIDB and DMICDC for early bird projects for Dholera SIR, DMICDC and Gujarat Government identified Dholera Industrial park as one of the early bird projects. The proposed Industrial Park called as “Activation Area” is spread across an area of around 22.5 sqkm within Town Planning Scheme 2 in Dholera SIR. The area has approximately 72kms of roads and has an optimum mix of land uses comprising of industrial, residential, mixed use, recreation, and tourism. 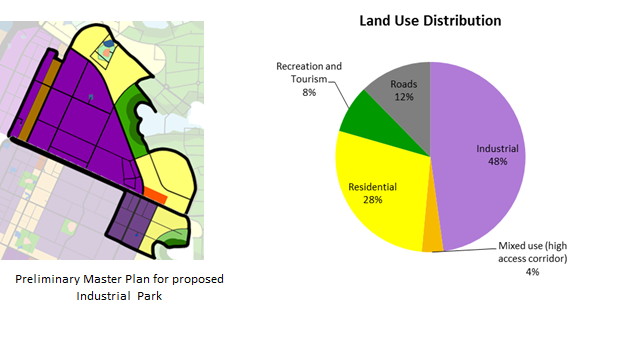 The area has been selected based on immediate availability of land and its future status after implementation of TP scheme (area with highest opportunity of commencement of site work). The area has existing connectivity to SH6 via the Coastal Road in the north of the site. Once the above listed infrastructure is in place, the proposed industrial park will have ready to move plots with all the services and infrastructure at every plots door step. At Present Roads and underground services project is under bidding process and target to commence by mid of year 2015. Bidding process for ABCD building, Adhiya River detail design and bunding to be start in early 2015.